Spyro the dragon is back and looking better than ever, so we imagine you're on the hunt for the cheapest Spyro Reignited Trilogy prices. Well, you're in the right place as we've swooped through all the best retailers to compare prices on both the PS4 and Xbox One versions so you can get the cheapest deal from our comparison charts. This is no mere HD re-release as we've seen many times from other fondly-remembered classics over the years though. Instead, the visuals have been completely redesigned for the modern gaming era, which considering the original Spyro Trilogy appeared on the PS1, is a great idea. If you played the updated Crash Bandicoot Trilogy last year, you know what to expect in terms of visual upgrades. 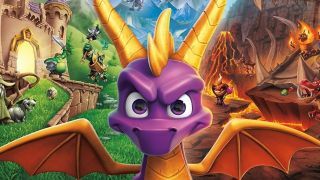 The Spyro Reignited Trilogy looks gorgeous on both PS4 and Xbox One, with newly detailed scenery and character models, but the gameplay and level design remains largely untouched, providing a proper blast of nostalgia. And thanks to the new visuals, you won't be needing those rose-tinted glasses. We've added some PS1 vs PS4 comparison shots just underneath the chart showing the latest prices for the new Spyro trilogy remake. So as you can see, Spyro has never looked better. Gameplay is a fond throwback to simpler times of collecting items and fighting off angry enemies with either a burst of flame or charging headbutt. It's great to see the camera controls updated too, so you can now use the right stick to control it instead of the shoulder buttons, although you can stick to the old style if you prefer. Generally, Spyro is a nice relaxing game and pretty easy to charge through. Well, for the most part. Flying levels and some of the boss fights can be a bit brutal - or maybe we've gotten used to things being too easy nowadays! Either way it's a solid pick for a trip down memory lane, or maybe introducing younger gamers to a legend of the platforming genre. Looking for some more presents still? Head on over to our cheap deals menu or take a peak at early bargains in our Boxing Day sales and January sales roundup.